Don’t worry, after this failed attempt at a normal Halloween, Michael Myers went right back to serial killing. (Oh, and it’s still Halloween, right? Sorry for the lateness of this comic!) Also, in case you missed it – you can now follow Optipess on Instagram and Tumblr! 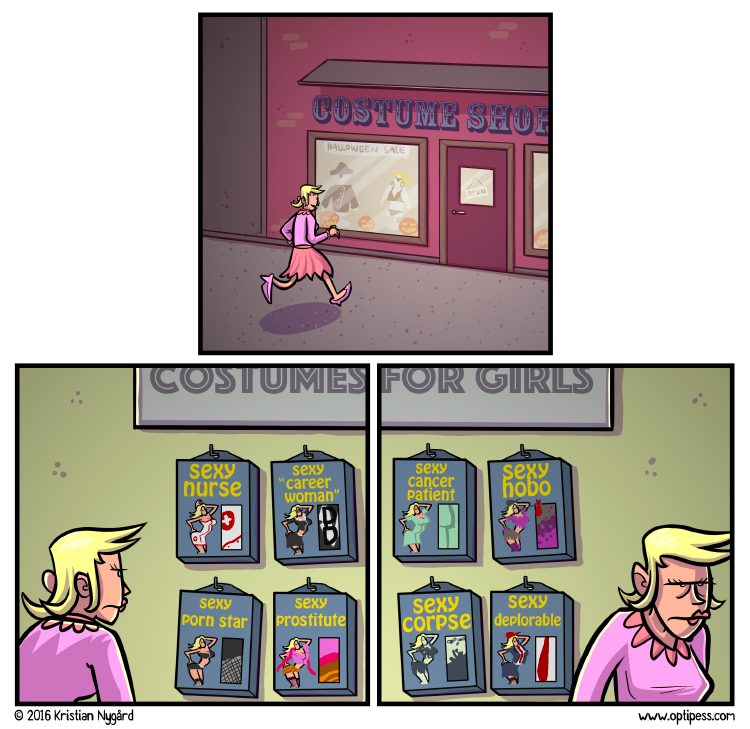 The scariest thing is that pretty much all these costumes actually exist. If this comic is late, and it probably is, it’s because I had to assign all these shiny new points! Speaking of social media, you can now follow Optipess on Instagram and/or Tumblr! Watch me struggle with learning how to use these platforms years after everyone else! Oops, this one arrives a bit later than usual, but it’s still Friday, right? (Sorry Australia). *INSERT ANNOYING LOUD NOISE HERE* Edit 09/09/16: Oof, no new comic today unfortunately. I blame my pesky day job! Things will also be rather busy next week as well, but I should be able to squeeze in at least one comic. Webcartoonist Fun Fact! I had forgotten how the mythical place of ”outside” looks, so I almost had to do a Google Image search for reference. 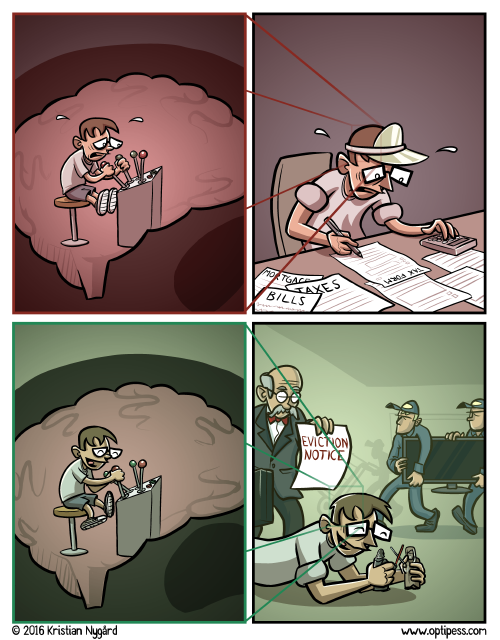 I had to spend hours upon hours to research that second message box in the last panel. It can truly be gruelling work to make comics, but you do what you gotta do, I guess. It’s actually called football (EVERYONE knows this), but I had to go with a word starting with S. Also, why isn’t this a Rocket League mode already? This one is probably inspired by getting jolted completely awake by a similar nightmare recently. Unfortunately it was four hours too early. Note to self: Don’t draw a bicycle ever again. This comic moves! It might also be moving, depending on how easily touched you are. If it’s NOT animating for you, click on through from your RSS reader, or try to use a web browser that has been updated in this millennium.